Haywards Heath is a town I have often travelled through, but never stopped to explore. I have been through there – both on a train to Wales and on my way to Winchester during my university days – but to me, it had always looked like any typical one-road town of shops. Much like Uckfield and Battle, it never seemed to bustle, the roads like an impatient cinema usher hurriedly beckoning people past rows of shops to other destinations; hence why, I imagine, it is named as a ‘commuter town’. Haywards Heath is a place on its way to somewhere else, so when I was asked where I wanted to go, I figured that Haywards Heath would be an interesting place to explore. I’d been all over the country – Winchester, London, Liverpool, Chester, out of the country to Spain and Norway and France – but never to this tiny town situated close to my village. I had been hoping for good weather but as it was turning into October, we were greeted with rain. Buckets of it. I was cheered up by the name of a shop I spotted on my way into Haywards Heath. Everyone seemed to be hiding from the downpour, so the walk down the strip of shops was relatively easy. I dipped into a square lined with quirky shops and found a statue; true to the season, they all seemed to have nose-dripping colds. Madam, would you like a tissue? The Victorian era definitely left a scar on the town. Every so often I found old frames painted on top of the crumbling bricks of establishments, clearly for old shop signs that had been whitewashed when the buildings had changed purpose and hands. As I stared up at signs like that, I found myself wondering what they once had been. Another notably Victorian relic is the famous Haywards Heath viaduct. This was the real reason I had wanted to visit the town. At the very end of my day I was driven down various country lanes (fearing for my life with every sharp bend, roaring off-road vehicles shooting straight at us) to a more open and straight bit of road. We parked in a lay-by, stepping out to the hollow barks of a protective farmyard dog, and for the first time I saw the impressive structure I had travelled over, without realising, on my way into London. In fact, as we exited the car there was a distant rumbling, which could have been mistaken for an aeroplane soaring overhead but was actually a train having just passed through Haywards Heath’s station. I trudged over the field, with its sign warning us to look out for cows, avoiding cowpats like they were mines until I was standing right by the arches of the impressive, gargantuan bridge. The fence had fallen, a warning sign defaced by cows that stated we could not cross the fence line due to falling chunks of brickwork. I stepped around to the backmost arch and did what I had been longing to do since hearing about the viaduct. I peered down through the arches behind it, making myself incredibly dizzy. There seemed to be infinite arches spanning onwards, stretching down into the dipping valley and beyond. I felt like I was all-seeing, and that made my head hurt. 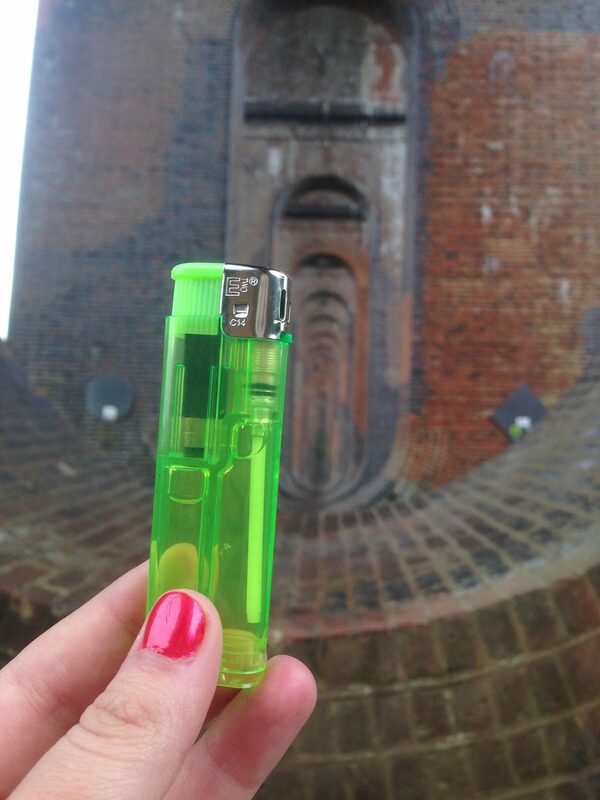 This seemed like the perfect place to take my lighter photo; earlier that day I had purchased a see-through lighter with the intention of taking it to the viaduct. Much like being able to see inside the lighter and view the workings of it, I could stare down at the arches supporting the viaduct up above my head and see how, even with the years having passed, the old Victorian bricks supporting up this vital railway line had stood the test of time. I even dared to sit up in one of the soggy arches and wait for a train to pass overhead; it was an experience, feeling the rumbles and vibrations travel throughout my body. Many others had clearly done the same as me, for graffiti had been scrawled on bricks higher up than my head. The viaduct was definitely the highlight of my trip, and I will return to explore Haywards Heath more fully when the weather permits it. A week or so later, on my way up to Wales, I passed over the viaduct and paused to look down at the field and remember – to visualise just how many bricks held me up and carried me on into London.